I did that just now, and nope, the problem still remains. It's due to some setting, I'm sure. I mean, it's INSTANT. I will be playing it on battery power, smooth as silk, plug it in and CHOPPY. Unplug it and it's smooth as can be. Very strange, indeed. to be honest, i have no idea at this point. i suggest you to contact lenovo support line and ship it back to service, try to perform clean windows installation and check if it helps or someone else may come better idea, if you wait. support, or direct from Nvidia? I got the drivers direct from the Lenovo support site. The nVidia site wouldn't allow me to install drivers, for some reason. Said the hardware was incompatible. It seems that the problem lies within the GPU. image(s) >50k converted to link(s). 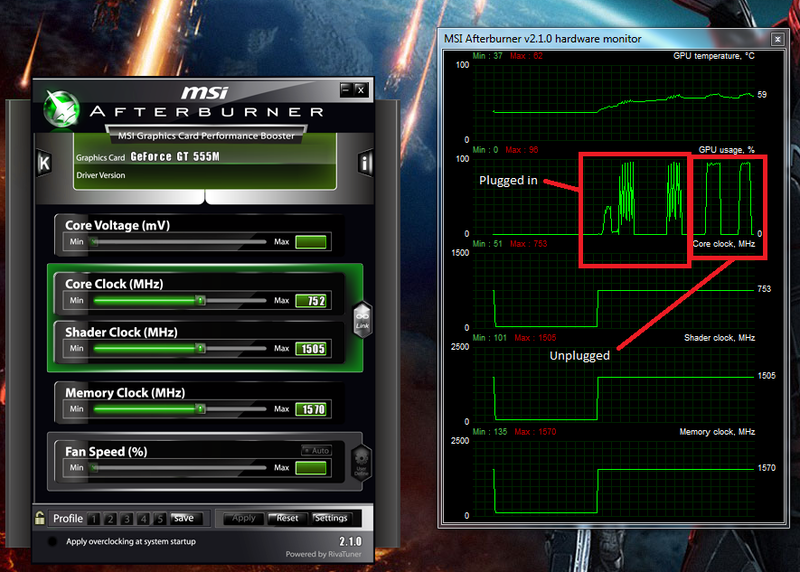 Are you using the MSI utility? Or just installed to test? If you are using it, uninstall. I had installed it only about ten minutes prior to taking the picture. 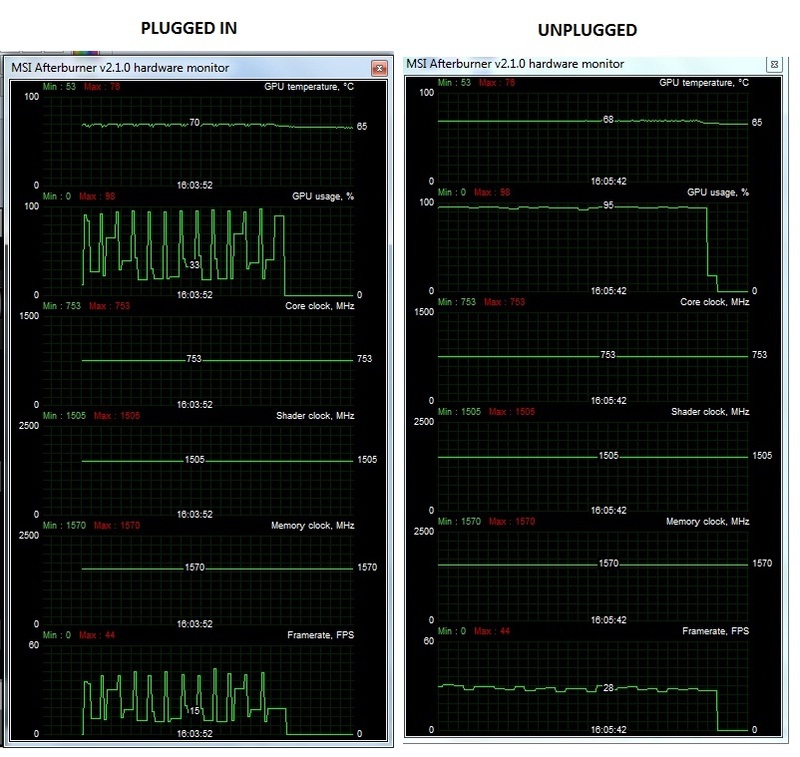 I just used the monitoring utility. I showed the full picture with the clocks on it to show it was at factory settings, sorry for making the wrong impression. I added in the FPS chart. Hope that helps a little. Wow, graphs clearly show the symptoms. those and Nvidia driver. A tough one. is clocking it down. Maybe! And don't rule out good old fashioned graphics hardware problem. I will keep my eyes open for troubleshooting ideas. I do hope it's not a hardware issue, sending it off would really impede me. I use this for more than gaming, it's just a fun distraction. I had originally thought that Lenovo's Energy Management and Windows' Power Management were conflicting somehow, and it seemed most likely, but I can't find any way to adjust the power settings of the dedicated GPU in either, just the integrated. Funny thing is, I don't think that I'm the only person to own a Y570, so surely someone else has to have this problem, right? I don't recall messing with any settings that couldn't be reversed. I even set all of the power settings to their defaults, to no avail.